This web-user gave a score of 3 / 5 to Vacances Bleues on august 2018, but declined to leave a comment. The heated towel rack in our bath was broken and was so hot it would burn you. It was 92 outside and also heated up our room. We asked three people at the desk before one came to see it and agreed it was broken and said he would have someone fix it the next day. It seemed better the next day but there was still no way to turn it off. It seriously heated up the entire room too much. This is the only reason for my poor on quality. Everything else was great. 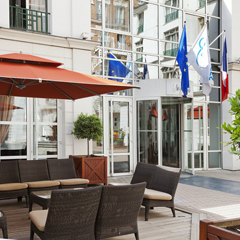 The hotel is located in a nice neighborhood and it's close to metro stations, restaurants and stores. The only problem is that the bathroom does not have a full shower curtain so water gets on the floor after you take a shower. The shower gel was empty when we arrived and we had to tell the housekeepers to replace it. The airconditioner in my room did not work. The TV does not have English channels. The guide sheet indicates the channels, but they are either wrong, or they are scrambled. I was completely satisfied with my staying at the hotel. Good choice for the money. Air conditioner not working in room. Basin blocked - water run out very slow. No English channels on TV. This web-user gave a score of 5 / 5 to Vacances Bleues on june 2018, but declined to leave a comment.